Information about applying for and administering the National School Lunch Program (NSLP). What are the benefits of participating in the program? What type of lunch must be offered? What is involved in operating a National School Lunch Program? What types of agencies may participate? Where can we get assistance? The National School Lunch Program is a federally funded program that assists schools and other agencies in providing nutritious lunches to children at reasonable prices. In addition to financial assistance, the program provides donated commodity foods to help reduce lunch program costs. The United States Department of Agriculture (USDA) is responsible for overseeing the program nationally. In California, the program is administered by the California Department of Education (CDE), Nutrition Services Division. For children, the National School Lunch Program provides a nutritious meal that contains one-third of the recommended dietary allowance of necessary nutrients. For parents, the program offers a convenient method of providing a nutritionally balanced lunch at the lowest possible price. For schools, the program enhances children’s learning abilities by contributing to their physical and mental well being. Studies have shown that children whose nutritional needs are met have fewer attendance and discipline problems and are more attentive in class. Please see our School Menu Planning Options page for meal pattern information and our Meal Patterns and Menu Planning page for complete information. Meal production records and inventory records that document the amounts and types of food used. The number of lunches served each day, by site and by category (free, reduced price, and full price). Applications submitted by families for free and reduced price meals, by site, and a description of the follow-up actions taken to verify eligibility. Records of income, expenditures, and contributions received. The CDE periodically conducts a comprehensive review of each agency’s lunch program. Those agencies that annually receive $500,000 or more in federal funds (from all sources) must also be audited each year. The National School Lunch Program is operated on a reimbursement basis, with agencies paid on the number of meals served. Agencies submit a monthly reimbursement claim form, available on the CDE fiscal Nutrition Services-School Nutrition Program Web page, to the CDE. After the Department reviews the form, the claim is sent to the State Controller’s Office, where the check is issued. Agencies typically receive reimbursement within four to six weeks after submitting the reimbursement claim form. Agencies that participate in the program are reimbursed from two sources: the USDA and the State of California. State reimbursement is paid for all free and reduced price meals. Federal reimbursement is paid for all free, reduced price, and paid meals. Visit our Rates, Eligibility Scales, and Funding page for current rates. Public and private nonprofit schools are eligible to participate in the National School Lunch Program. Also eligible are public and private nonprofit licensed residential child care institutions (e.g., group homes, juvenile halls, orphanages). Nutritionists and program staff from the CDE are available to provide free technical assistance and guidance on how to operate a National School Lunch Program. Assistance is available on such topics as menu planning, proper food storage and preparation, record keeping and reporting, and clarifying federal and state regulations. Visit the School Nutrition Program (SNP) Primer Web page for resources, materials, and technical assistance in the administration and operation of the SNP. Please see the county list of School Nutrition Programs (SNP) specialists in the Download Forms section of the Child Nutrition Information and Payment System (CNIPS). You may also contact the SNP Unit Secretary by phone at 916-322-1450 or 800-952-5609. Wordware Lunch Cashier system assists with your staff and parents to the new lunchroom software and is always here to help with any questions that may come up encounter while the process or after implementation Schools quickly learned how helpful our team is from the beginning and they are pleased with the technical support being provided by wordware’s experienced and dedicated technical staff. Wordware Support Team set up the software for the schools and provide training to your school staff up to the level they needed to learn the ins and outs of our school cafeteria software. From the launch of the new software, School Food Service Directors, was happy that Wordware Lunch Cashier system would be an excellent fit for the children in their school. March is National Nutrition Month. Throughout the month, USDA will be highlighting results of our efforts to improve access to safe, healthy food for all Americans and supporting the health of our next generation. The U.S. food supply is abundant, but many consumers are experiencing nutritional shortfalls. Some are overfed but undernourished at the same time. Observing trends in U.S. diets is possible based on food-consumption data collected during the annual “What We Eat in America/NHANES” dietary-intake survey. The USDA Agricultural Research Service (ARS) is responsible for the consumption interview, one of several components of the National Health and Nutrition Examination Survey (NHANES) conducted by the U.S. Department of Health and Human Services. 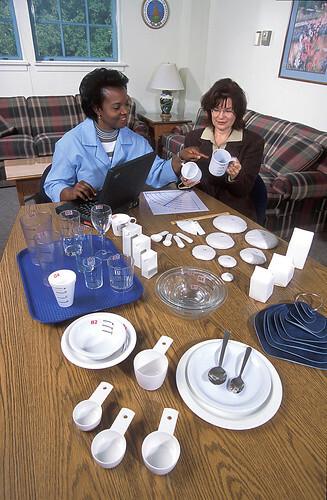 The dietary survey is managed by researchers at the Food Surveys Research Group in Beltsville, Md., part of the ARS Beltsville Human Nutrition Research Center. 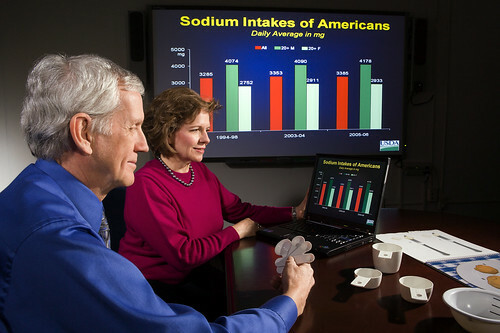 Each year, the “What We Eat in America” computer-based dietary interview is used to ask more than 5,000 individuals nationwide about the foods and beverages they consumed. The participants’ dietary supplement intakes also are collected. Research nutritionists then translate “what’s eaten” into “nutrients consumed.” The survey data—after analysis—provide insights into the population’s nutrient-intake status, such as overconsumption, nutritional shortfalls, healthy snacking and poor eating. Here are some of the dietetic trends based on “What We Eat in America” survey data collected in 2011-2012. —On average, U.S. individuals are getting only about half their daily recommended intake for dietary fiber and potassium. And well over one-third aren’t getting their recommended calcium, magnesium, vitamin C and vitamin A from foods and beverages. —More than 90 percent are not getting their recommended vitamin D from foods and beverages. Based on supplement use tracked, about one-fourth took a supplement containing vitamin D, and more than half of women aged 60 and older took one. —Lunch is the meal most frequently skipped. On any survey day, one in five individuals did not eat lunch. —On a given day, more than half of individuals ate at least one food or beverage that was obtained from a restaurant. The proportion is higher for young adults. Two-thirds of those aged 20 to 39 ate food or beverage obtained from a restaurant. When consumed, restaurant foods and beverages contributed more than 40 percent of daily calories. —Overconsumption also is a problem. Based on the survey data, individuals consumed 3,500 milligrams of sodium on a given day, which is about one-third more than the recommended maximum for adults with no known risk factors. Essential vitamins and minerals help the body stay healthy and function properly. “What We Eat in America” data results are informative to consumers and professionals. To keep up with what’s trending based on “What We Eat in America,” visit the USDA-ARS Food Survey Research Group Web site. Our Lady of Lourdes Catholic School installed the Lunch Cashier System to automate the tracking of student lunches. In the cafeteria, we installed the Lunch Cashier System to automate the tracking of student lunches. Then as the student eats hot lunches at school or purchases milk, they present their ID card (the same ID card that is used in the library, see above) and the funds are automatically deducted from that student’s account. We also offer many academic, sport, and social gathering opportunities for students, staff, parents, and the community at large to come together and unite as one in support of the school and its mission. Our Lady of Lourdes Catholic School has been accredited by the Wisconsin Religious and Independent School Association (WRISA). For more information on this topic please refer to the Accreditation page located on this site. Our Lady of Lourdes faculty includes a combination of both full and part time staff, including administrative support people and food service personnel. All are 100% dedicated to teaching the highest academic standards and living the Catholic faith with all students. Our teachers are top notch with most of them having a current Wisconsin teaching certificate in the area they teach and others having a college education majoring in the subject they teach. The teaching staff is expected to have religious certification from the Diocese of Green Bay. Everyone in our school community is very dedicated to Catholic education and Our Lady of Lourdes Catholic School. We would be happy to answer any questions that you may have or to assist you in learning more about our school and what we have to offer. Please call us at 920-336-3091. Have a great day and may God bless you and yours. Author anuruddhaPosted on April 14, 2016 April 14, 2016 Categories Cafeteria Software, School Lunch Software, Software for School CafeteriaTags accounting system for schools, affordable meal management system, automated Point Of Sale (POS) lunch system, Best Nutrition Software, cafeteria accounting software, Cafeteria accounting Software program for schools and businesses, cafeteria payment system, Computerized Lunch Program for school cafeterias, Corporate Lunch Programs, Family Key to register with Wordware, Family Lunch system, family's school lunch accounts, Food Services POS system, Lunch Cashier System Wordware, Lunch Payment System, lunchroom management software, online nutrition software, payment software for lunch accounts, POS Debit System, POS system for the school lunch program, School Lunch POS, School Lunch POS Software, School Lunch Software, State and Federal reporting, Student Based Solutions, Technology solutions for the cafeteria and beyond, Web Based Point of Sale, Wordware Lunch Cashier software, wordware Lunch Cashier System, wordware Public School LunchLeave a comment on Our Lady of Lourdes Catholic School installed the Lunch Cashier System to automate the tracking of student lunches. The cost of an elementary school lunch is currently $1.95. Monthly lunch and breakfast menus can be found on the district website. Students who do not wish to eat a school lunch should bring a lunch from home. These students have the option to purchase milk in the cafeteria. (2) Electronic deposits to the account can be made using your credit card or checking account can be made at any time via e-Funds for Schools. Families can view lunch-account balances, payments, and meal history via Wordware. Your family ID and password/PIN are required. For assistance with your ID or password (or for more information), call the Child Nutrition Office at 845-4139. The district offers a meal-assistance program for qualifying families, in the form of free or reduce-price lunches. Great care is given to respect the privacy of families receiving assistance. Applications are submitted direction to Child Nutrition Services. School staff, other students, and families do not have access to information about which students receive free or reduced-price lunches. For more information, call the Child Nutrition Office at 845-4139.
to get started. Then it will ask for our state and our school district. Please call the Food Service Office, 319-334-7423, and we’ll be happy to give you your Family ID (Username) and PIN (Password). You can also e-mail me at: kcrosssley@independence.k12.ia.us Once you get to your account information on the Wordware, Inc’s website, you’ll see information for thecurrent month only. At the bottom of this page, you’ll see a place to see a detailed report of transactions.This is also for the current month only. If it is the first or second day of the month, you will only see purchases and deposits for those days. At the bottom of the detailed report, you will see an opportunity to request a statement for more transactions. If you request a statement and there is a problem, please e-mail me directly and I will mail you a statement going back as far as you need it to go. To make a payment online After you have looked up your account on Wordware, Inc’s web page as instructed above, at the bottom of the page, you’ll see “To make a payment, Click Here”. If you “Click Here”, it will take you to our online payment page, called eFunds. Once on the eFunds page, you can either log in using the account you’ve already set up, or you can set up a new account where it says, “New Users”, click on “Register Here.” It will take you through several steps of taking your information and either credit card or checking account information, and will also have you link yourself to your student(s). You won’t be able to make a payment until you are linked to a student in our school district. If you have any problems getting to any of these webpages or need further assistance, please call the Food Services Office, 319-334-7423. The eFunds support team is also very good and will help you get set-up or fix any issues you have with making a payment. Thank you for choosing to access your account online!! Independence is a fantastic community located in Northeast Iowa. It has a population of around 6,000 residents and approximately 1345 students. The community of Independence is situated between the cities of Waterloo/Cedar Falls to the West and Cedar Rapids to the South. The beautiful Wapsipinicon River flows through Independence, providing for summer recreation. The school district includes the communities of Rowley, Brandon, and Independence. The community is proud of its strong school district and the dedicated staff who work here. Thank you for taking the time to investigate what we are doing in the district. Together we can make a difference in the lives of students. The school year is upon us and we have rolled out a new tool allowing families to use usernames and passwords to check their lunch account balance online. This will ensure family financial information remains secure. Log in to Wordware, Inc. family login as usual using the Lunch Account Balance link in the Quick Links section of the front page of our website. A short message will come up with a message regarding the changes and an option to complete the registration form. Please complete our REGISTRATION FORM for a user account. After you register your user account you will then be able to access the family login using your secure username and password. If you have not signed up to go online to check your family lunch balance or you have any difficulties with the system, please contact Ann Beckman or Paula Jensen to sign up! St. Louis School uses Wordware Cafeteria Software to process all cafeteria operations. One feature of this software is to automatically send emails to families with low balances, replacing the time and expense of producing paper statements for families with access to email service. Contacting families concerning their lunch account will be handled electronically, without involving additional personnel or expense, while keeping you better informed. Families will be able to view their account balances anytime using the online access feature. Printed statements will be replaced with emails, for families that have supplied the school with an email address. •Emails will be processed and sent out around 6:00p.m. each evening. •Families must know their family account ID number and PIN to access online family account information. If you have misplaced this information please emailsmeier@stlouiswaco.org and your account information will be emailed to you. At the beginning of the school year, students will bring home a letter explaining our procedures. Your family account number and PIN will be included in this letter. • You can view your balance information, along with a 2 week detail lunch history.